The Soldiers' Angels Special Operations Forces Team is a team of amazing Angels designed to serve only Special Forces and Special Operations service members. Recently, we received a very special "Thank You" letter for this very special team. 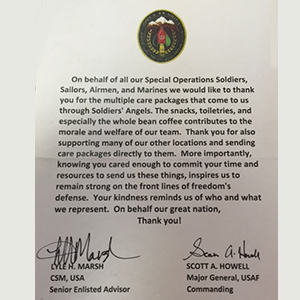 It read: "On behalf of all our Special Operations Soldiers, Sailors, Airmen, and Marines we would like to thank you for the multiple care packages that come to us through Soldiers' Angels. The snacks, toiletries, and especially the whole bean coffee contributes to the morale and welfare of our team. Thank you for also supporting many of our other locations and sending care packages directly to them. More importantly, knowing you cared enough to commit your time and resources to send us these things, inspires us to remain strong on the front lines of freedom's defense. Your kindness reminds us of who and what we represent. On behalf of our great nation, Thank you!" - Lyle H. Marsh CSM, USA Senior Enlisted Advisor and Scott A. Howell Major General, USAF Commanding. If you are interested in becoming part of the Soldiers' Angels team that supports Special Forces and Special Operations units, click here.